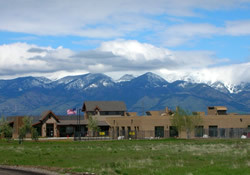 The Humane Society of Gallatin Valley (HSGV), a group of concerned citizens incorporated in 1973, built a shelter on top of an old city land fill on Rouse Avenue in 1975. This shelter was largely built by volunteers, and the land was leased from the City of Bozeman for $1 per year. During the first years of the shelter on Rouse, the executive director also acted as the caretaker and lived in an apartment that later became the cat adoption room. In 1987, after Pierce Trailers donated a trailer to the shelter, the ED/caretaker moved into the trailer, allowing the cats to be moved out of the dog adoption facilities and into an area of their own. The original shelter quickly became over-crowded and was expanded with two additional trailers and outdoor kennels for most of the dogs and many of the cats. HSGV also held contracts with the City of Bozeman, Gallatin County and West Yellowstone to receive lost, stray and impounded animals. The guiding principles of HSGV included a no-kill policy, open door admissions and compassionate care of all animals that came into the facility. 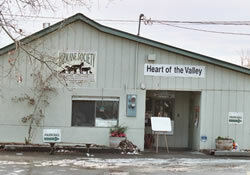 In March of 2004, the memberships of HSGV and Animal Services Center Inc. voted to merge the two organizations to create a new organization called the Heart of the Valley Humane Society (now Heart of the Valley Inc.). Soon after the merger, Heart of the Valley (HOV) began to seriously consider its options for a new facility. By this time, the shelter on Rouse was totally inadequate and was beyond repair and refurbishing. Realizing that they could no longer effectively serve the rapidly growing Gallatin County, and surrounding region of Ennis and West Yellowstone, HOV’s board of directors began a campaign to raise $4 million to build a new shelter and $1 million for endowment. The new shelter was to be built on 58 acres on Cameron Bridge Road which initially belonged to Animal Services Center. By October of 2007, the funds to build the new building had been raised, and HOV had moved into the new facility. The 19,850 square-foot shelter has indoor housing for all the animals as well as state-of-the-art technology for keeping the facility clean and disease free. It includes an adoption center, a veterinary services room, administrative offices and a community room for meetings and public outreach programs. This new shelter brings not only cleaner, more humane conditions for the pets who will make this their temporary home, but it is also the start of a fun, educational animal haven for the entire community. This shelter will be a place of refuge for the homeless animals of the community—and for people who want to hang out with the animals!